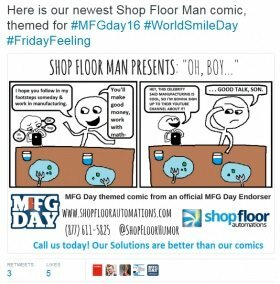 MFG Day 2016 Shop Floor Man Comic Strip from SFA Inc.
One of the final posts we put up about MFG Day 2016 was a specially themed Shop Floor Man comic to celebrate the day. It received a good amount of buzz on social media, and we wanted to share it here. Shop Floor Automations is an official endorser of MFG Day and we realize the importance the holiday has. It is so important that future generations be involved and get interested in the manufacturing industry. Be it a machinist, a programmer, an engineer, etc. – the industry must continue to thrive. We reviewed the reasons why manufacturing makes a difference for the USA in this previous post. Shop Floor Man is our newest creation to help exemplify the benefits of upgrading your shop floor. He is a reflection of the frustrations and crazy things that happen in this industry, and we hope you enjoy his presence on the interwebs! We are on social media here, and you can call us at (877) 611-5825 for more info!